Almost eight months ago, the CORBA was approached by Keenan Koch, a student at St. Francis high school in La Canada, a member of the school’s mountain bike race team, and an eagle scout candidate with troop 355. He wanted to work on El Prieto for his eagle scout project, the closest singletrack to his school. After consulting with Banner Moffat from the Friends of El Prieto and CORBA over the ensuing months, a plan was developed and submitted to the Forest Service. The section of trail in question was “built” by users blazing their way down the canyon after the Station Fire and subsequent floods ravaged and destroyed the trail. The original trail through this section was completely obliterated. The resulting user-made trail was on the edge of a cliff that was getting undercut by the stream and was gradually narrowing. It was a hazardous section of trail where several people have reportedly gone over the edge and crashed. It was too narrow and unstable for equestrians, and nerve-wracking for anyone concerned with heights or exposure. 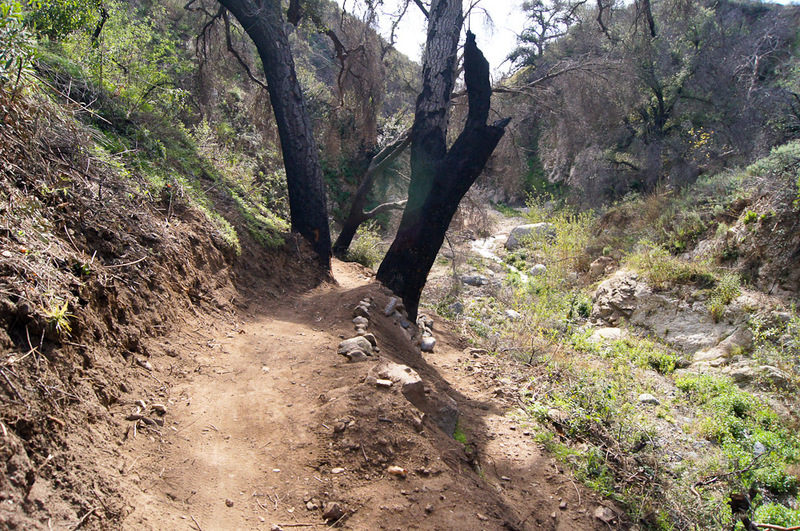 With Forest Service and Boy Scout Council approval, Keenan rallied his St. Francis and San Gabriel Valley Composite mountain bike team mates, fellow scouts, and a few willing parents to come out and rebuild this section of trail. The trail was flagged out by Banner Moffat and after two days of prep work by him and Steve Messer of CORBA, was ready for the project. Initially planned for the weekend of January 21/22, rain forced a cancelation for the work on Saturday. In reality it was a blessing as the dampened earth was much better to work with on Sunday. Crews re-cut the bench away from the cliff edge, filled three substantial drainages with rock supporting walls and rock armoring, and built up rock supporting walls either side of a “split tree,” through which the trail would pass. With 19 volunteers this section of trail, about 45 yards, was restored. 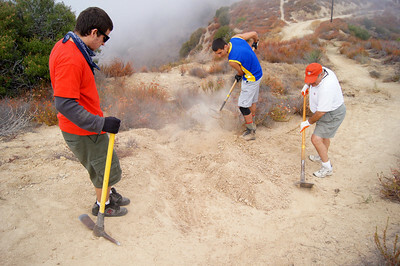 An intrepid crew of four stayed on an extra two hours beyond the finish time to ensure the rebuilt section was completely passable for all trail users. During the course of the work, two generous mountain bikers made on-the-spot cash donations to CORBA’s trail crew fund (and who still need to email Steve for receipts), a sure token of the appreciation all trail users have for the work we are doing. One regular El Prieto hiker has made similar on the spot donations in the past, and came through very much appreciative of how the funds have been applied (new tools and rock slings for the trail crew and for Friends of El Prieto). 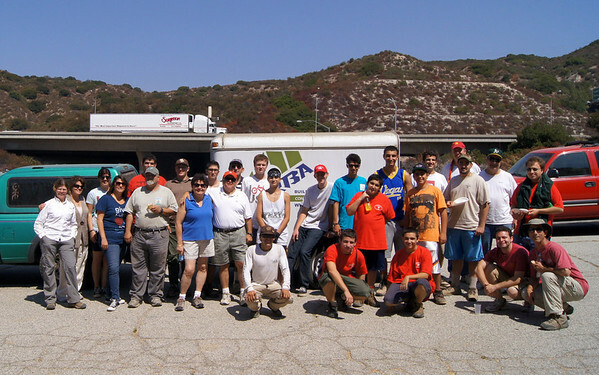 On Sunday, September 11th, 32 volunteers headed up Hostettor road (La Tuna Canyon) in the Verdugo Mountains. Eagle Scout candidate and St. Francis High School racer Steven Ayoob had chosen to work on the trails at Verdugo Peak for his Eagle Scout project. Verdugo Peak is the highest peak in the Verdugo Mountains. CORBA trail crew volunteer Steve Messser served as an advisor for the project, supplying CORBA’s tools and expertise. Steven Ayoob is a member of Boy Scout Troop 127 out of Glendale, and is the troop’s fifth Eagle Scout candidate for 2011. 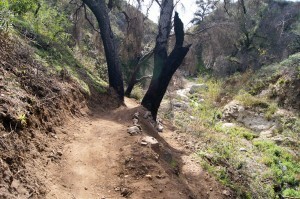 He has ridden the trails in the Verdugos and wanted to help improve and preserve them. 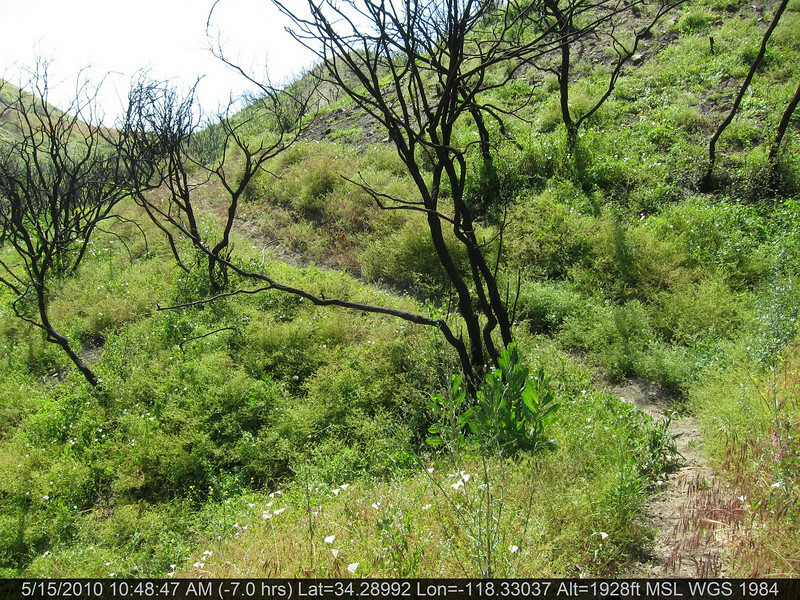 The user-created trails that lead up to the peak along the old firebreaks have been ridden and hiked for decades. They have been becoming increasingly rutted and eroded in recent years. About 32 volunteers came out to help with the project, filling ruts, cutting in rolling dips and nicks to divert water, and trimming brush. Ayoob also had some of the volunteers install a restored and freshly painted park bench on an overlook near the top of Whiting Woods motorway, giving weary hikers and riders a place to sit and enjoy the views of the Crescenta Valley and San Gabriel Mountains. One of the volunteers who came out was Eagle Scout Chris Sercel, whose Eagle Scout project was the restoration of the Doc Larsen trail in 2010. He put the leadership and trailbuilding skills he’d learned in his project to good use, helping direct one of the two crews working on different sections of the trail. Sercel’s Court of Honor, the ceremony and final step in the long trail to become an Eagle Scout, was held the day before on Saturday, September 10th. At that ceremony Chris surprised CORBA’s Steve Messer with an Eagle Scout Mentor pin for his guidance on the Doc Larsen project, a true honor. Ayoob’s Eagle Scout project was coordinated with the City of Glendale’s Community Services and Parks Department. CORBA thanks Steven and all the volunteers for their contributions to Glendale’s trails, and we congratulate him on a successful Eagle Scout Project. 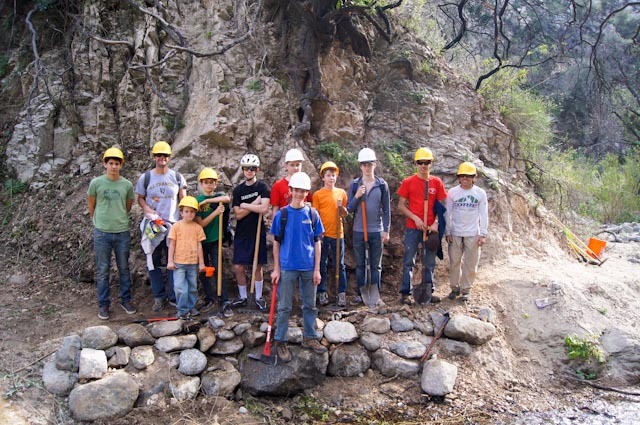 CORBA will be assisting Chris Sercel with his Eagle Scout project to restore the Upper Doc Larson trail in the Sunland area of the Angeles National Forest. 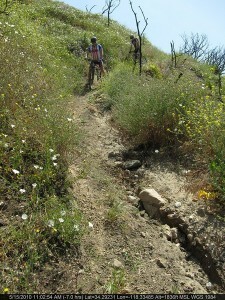 Doc Larson trail is a multi-use singletrack. We’ll be working on the upper section, and a singletrack connector trail that ties it into a loop with the surrounding fire roads. Meet in Lake View Terrace at the address above and either carpool or ride to the trailhead. Meet at 7:30 at the address listed on the CORBA trailwork calendar, and we’ll carpool or ride up from there. Be sure to bring sturdy shoes, long pants and long sleeve shirts. We’ll be doing brushwork and some treadwork. This area is still within the Station Fire closure area, so we’ll be working with special permission from the Forest Service. A second day of work will happen on July 10th to complete the project. Lunch will be provided so please RSVP to csizzles99@gmail.com and/or to trailcrew@corbamtb.com, or on the CORBA Google Calendar if you have a google account.